PART MODELER comes complete with fully associative drafting capability. 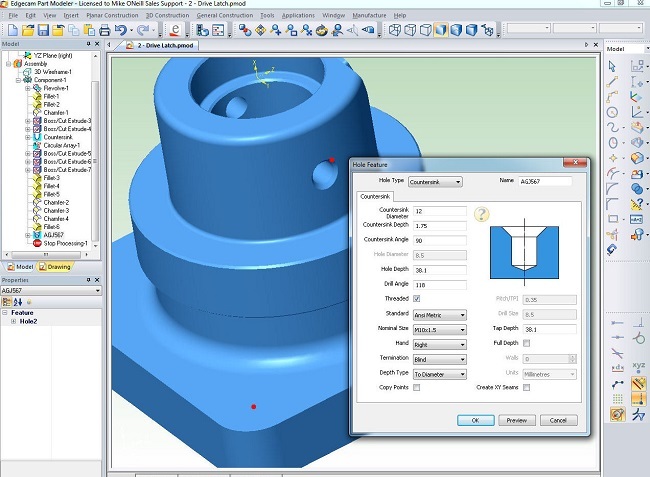 It’s the perfect complement to EDGECAM Solid Machinist – providing advanced modelling tools to create parts or work holding systems such as chuck jaws or fixtures. The major features of a machine tool can also be modelled, for accurate cutting simulation and collision detection within EDGECAM. Part Modeler’s intuitive user interface can be quickly and easily tailored to individual requirements, with features such as dockable windows and customizable menus and toolbars ensuring a highly productive, smooth and seamless progression from design concept through to finished component model and detail drawing. is a powerful and seamlessly integrated CAM system for generating machining strategies and NC code from solid models. Part Modeler data is loaded directly into EDGECAM, where innovative functionality offers state-of-the-art solids-based machining. Automatic feature recognition enables machinable features to be identified, with EDGECAM, then offers the most appropriate tooling and strategies to cut them. The associative link between EDGECAM Solid Machinist and the original Part Modeler data means that even late design changes won’t affect lead times. Used in conjunction with EDGECAM Solid Machinist, EDGECAM Strategy Manager provides automated machining of solids and a rapid return on investment through increased productivity.